NASA's Deep Impact probe took this image of comet Hartley 2 on Nov. 2, 2010, from a distance of 2.3 million kilometers (1.4 million miles). The white blob and the halo around it are the comet's outer cloud of gas and dust, called a coma. At this distance, the spacecraft captures images with a resolution of about 23 kilometers/pixel (14 miles/pixel). After a cosmic chase lasting months and covering millions ofmiles, a comet-hunting spacecraft finally?caught its icy quarry this morning(Nov. 4). Mission scientists hope the rendezvous reveals what Hartley2's icy nucleus is made of. By comparing Hartley 2 to the four other cometsspacecraft have visited, they're hoping to gain a better understanding of cometstructure and behavior, and perhaps of the solar system's formation. "This comet is unlike any we've visited before, and wedon't know what we're going to find," Mike A'Hearn of the University ofMaryland, principal investigator of Deep Impact's mission, said before theencounter. Researchers are eagerly anticipating sifting through the wealthof comet observations Deep Impact is expected to beam back to Earth. During theencounter, the spacecraft is expected to snap about 118,000 images, NASA officialssaid. The $252 million Deep Impact spacecraft took a circuitousroute to Comet Hartley 2. NASA launched the current spacecraft in 2005 to serve as amother ship for the Deep Impact mission, which intentionally sent an impactorprobe crashinginto the comet Tempel 1 in July 2005 to study the object's composition. After that mission ended, NASA decided to squeeze some morelife out of the Deep Impact observer spacecraft. They planned to send it aftera comet named Boethin, aiming for a close flyby in December 2008. But thatdidn't pan out because Boethin vanished, likely breaking up into many tinypieces. So researchers settled instead on Comet Hartley 2, a smallice ball that makes a long, looping trip around the sun once every 6 ? ?years. ?The comet wasdiscovered in 1986 by Australian astronomer Malcolm Hartley, who planned tobe in the Deep Impact mission control center at JPL during the rendezvous. On June 27 of this year, Deep Impact whipped past Earth,using our planet's gravity to set it on a course for Hartley 2. The extendedmission to rendezvous with Comet Hartley 2 costs about $42 million, NASAofficials have said. In September, Deep Impact went into approach mode as itneared its icy target, taking pictures and gathering data to prepare for theflyby. Yesterday, at about 4 ?p.m. EDT (2200 GMT), it switched toencounter mode. Deep Impact locked its instruments ? two telescopes withdigital color cameras and an infrared spectrometer ? on Hartley 2, and the datastarted pouring in. 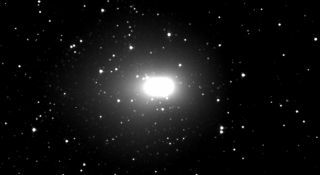 Deep Impact will continue photographing Comet Hartley 2 forabout three weeks as the comet speeds off into the dark reaches of space. Afterthat point, the spacecraft's comet-watching mission will be basically over, andDeep Impact will be decommissioned after a final calibration run, NASAofficials said. The spacecraft can retire with its head held high, havingdelivered on two separate comet-hunting missions, mission managers said. "This is going to give us the most extensiveobservation of a comet to date," said Tim Larson of NASA's Jet PropulsionLaboratory. Larson is project manager of Deep Impact's mission to Hartley 2,which NASA calls EPOXI. The first photos should start flowing into researchers'computers within an hour or so after the rendezvous, scientists said. But thecomplete data dump will take awhile. Data from the close approach will continue to downloadthrough Saturday (Nov. 6), but NASA will release preliminary results soonerthan that. A news conference is scheduled for 4 p.m. EDT (2200 GMT)today (Nov. 4), agency officials said. NASA's broad EPOXI mission has been using the recycled andrepurposed Deep Impact spacecraft to track and study various celestial objects.The name "EPOXI" is derived from the mission's dual scienceinvestigations ? the Extrasolar Planet Observation and Characterization (EPOCh)and Deep Impact Extended Investigations (DIXI).